Lucas Grafton has spent the last ten years hunting the Conclave, a secret organization who took everything from him: his wife, his child, his very identity. Now he has a lead—an imminent terrorist attack on London—code-named Descartes. Born with a genetic illness, Jenna Young has always known she was different. But the unexpected death of her father catapults her into a world of murder and terrorism she never expected. 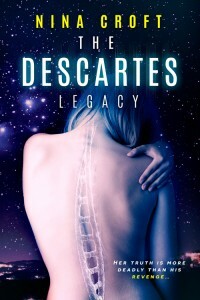 In order to stay alive, she must solve a twenty-five year old mystery—and her only ally a hard bitter man in search or retribution, her only clue the Descartes Highlands, an area on the near side of the moon. Luke’s need for revenge collides with Jenna’s hunt for the past, and together they must stand against the Conclave. All the while uncovering the truth behind Jenna’s illness, a truth that will make Jenna question her very humanity.